The Elima-Draft® Corporation has developed a new innovative patent-pending cover for HVAC systems and forced hot air systems to minimize dust and allergens found in air conditioning and forced hot air ducts in residential homes. The Elima-Draft Magnetic Allergen Relief Vent/Register Filter Covers are lined with high-grade polyester vent filter liners that help to remove invisible allergens trapped in dust that come from both central air conditioning and forced hot air systems. The electrostatic vent filter liner is made of different size fibers that attract different size particles for optimum filtration. Our covers are designed similarly to our A/C Isulated Magnetic Vent/Register Covers and attach to both steel and aluminum vents/registers in secondsa not tool required. mfr: Elima-Draft Incorporated The Elima-Draft® Corporation has developed a new innovative patent-pending cover for HVAC systems and forced hot air systems to minimize dust and allergens found in air conditioning and forced hot air ducts in residential homes. 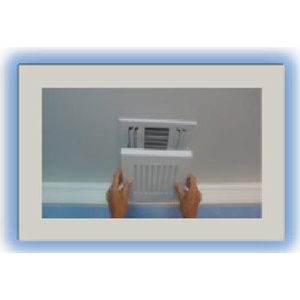 The Elima-Draft Magnetic Allergen Relief Vent/Register Filter Covers are lined with high-grade polyester vent filter liners that help to remove invisible allergens trapped in dust that come from both central air conditioning and forced hot air systems. The electrostatic vent filter liner is made of different size fibers that attract different size particles for optimum filtration.